Zeugma is a modern, highly optimised, open-source Z-machine implementation for the 6502 processor family. It is designed around a virtual memory model, where pages are retrieved on demand from an external storage resource, 512 KB in size, which must be preloaded with the game file. 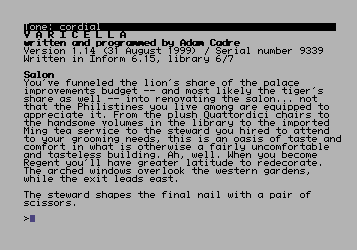 There are tools to extract story files from Infocom's C64 releases, and if you load those files into zeugma you will experience a dramatic speed improvement compared to the original, despite the fact that text is now rendered using bitmap graphics in order to fit more characters on the screen. Apart from the obvious benefits of loading from REU rather than floppy, the increased responsiveness is the result of highly optimised code, with extensive use of redundant decoding look-up tables, inlining, self-modifying zero-page code and other trickery. But see below for some depressing facts about recent games. While the Z-code engine itself is written in generic 6502 assembly language, the virtual memory solution and input/output facilities are platform-dependent. Currently, there is only one implementation, Zeugma-C64-REU, for a Commodore 64 (or a C128 in C64 mode) with a 512 KB RAM Expansion Unit. Today, most active C64 users own a multi-function cartridge such as the 1541 Ultimate, which can be configured to provide REU functionality. For now, zeugma requires the game file to be preloaded into the REU before the program is run, something which is easily done via the menu system of the 1541 Ultimate. Should you wish to use this program with a vintage REU from Commodore, you'll have to devise some alternative way of getting the story file into the REU. Added 131001: To run Zeugma on a 1541 Ultimate II, configure the Ultimate for a 16 MB REU and use at least version 1.2 of Zeugma. The widehack version is required for the Infocom game Trinity. Zeugma is released under the MIT license (included in the source tarball). The font (Schumacher Clean 6x8) is redistributed in compliance with its license, also included in the source tarball, and a copyright notice is displayed when the program starts. Being active in the C64 demoscene, and more of a lurker in the world of interactive fiction, it struck me that the two communities have certain things in common. Both are about exploring an obscure art form and finding joy in constraints that appear stifling or pointless to outsiders. Both have formed around some once-blossoming technology — commercially viable years ago, now overtaken by shinier gadgets and left by the wayside — that has been picked up by amateurs and nourished into sprouting more beautiful flowers than ever. Likewise, both communities attract the kind of patient, intelligent people who understand the distinction between vivid imagery and photorealistic graphics, and for whom instant gratification has about as much appeal as instant coffee. The history of the Z-machine goes as follows: Drafted in 1979 on a coffee table in Pittsburgh, with the aim of making the game Zork (hence 'Z') platform independent, it went on to give the company Infocom a competitive edge: Their text adventure games could be developed once, and then released for an assortment of computer systems. In the mid-1990s, thanks to Graham Nelson, Mark Howell and several other enthusiasts, the format was reverse-engineered. A high-level language, Inform, was invented for writing interactive fiction that would run on all the existing Z-code interpreters. As technology marched on, people got their hands on more powerful computers, and Z-code interpreters were implemented for them. Newly written games were larger, because computer memory had become plentiful. The file format was extended, and at some point backwards-compatibility with the old interpreters was abandoned. Furthermore, as computers got faster, games got slower, but nobody noticed. Fans of interactive fiction and vintage computer enthusiasts flocked together into separate subcultures. Zeugma is an attempt to bridge the gap between them. C64 aficionados now have access to a wide selection of interactive fiction, some of very high quality. For the interactive fiction crowd, the benefits are not as obvious. However, I personally find that the vintage hardware brings back something to the playing experience that got lost along the way. You sit down in front of a physical machine that is running nothing but the game. There are no distractions, popups, forums, inboxes, reminders, instant messages and what have you. Every turn takes a few seconds, so you think before you type. You don't speed-read for keywords while fluttering aimlessly around the map, instead taking the time to actually read the text and let it sink in. I find that this does wonders for the sense of immersion. Also, because there's no scrollback, and because you can't conveniently have a text-editor running in another window like on a modern computer, you'll find yourself drawing maps and making notes in pencil. All of this makes the exploration of the game delightfully tangible, and the notes become an embodiment of your personal view of the fictional world. Zeugma supports Z-code versions 4, 5 and 8 (story files with filename extensions .z4, .z5 and .z8). Some games come in blorb files, from which the story file must be extracted. Here are some tools for that. Old Infocom games fly. Inform 6 games walk. Inform 7 games are unfortunately way too slow to be playable (unless you happen to have a 20 MHz SuperCPU). I might elaborate on the technical reasons for this in a later post. Spiral (Justin Morgan, 2012). This game ranked #6 in the 2012 Interactive Fiction Competition, proving that high-quality games are still being developed in Inform 6. Varicella (Adam Cadre, 1999). This is a difficult game, but many agree that it's a masterpiece. Trinity (Brian Moriarty, 1986) and Bureaucracy (Douglas Adams et al., 1987) are two lovely games from Infocom. Activision, the owner of the copyrights, has been re-releasing Infocom games as recently as 2012 (for iOS), so these titles can't really be regarded as abandonware. If you own the original disks, there are tools to extract the .z4 files from them. Trinity refuses to run in the relatively cramped screen space provided by Zeugma-C64-REU (53 x 25 characters). Use the widehack version of the interpreter to get around this; it will lie to the game about the size of the screen, so some quote boxes will end up in strange places, but the game is playable. As mentioned, Inform 7 games are too slow to play. This is the greatest limitation in my opinion. In addition, zeugma currently doesn't support file system operations. This means you can't save or restore games, and you can't work with transcripts. Also, for reasons of performance and memory conservation, undo and restart are not supported. To restart the game, you have to preload the REU again, and relaunch zeugma. Zeugma-C64-REU is monochrome, but provides bold and reverse text styles. Non-ASCII characters are currently not displayed correctly. A zeugma is a rhetorical device that, much like a virtual machine, lets you re-use a piece of meaning in several contexts without having to write it all over again: With zeugma, authors have access to an antique type-saving device; an antique tape-loading device, authors. 130915 1.1 Bugfix in op_tokenise. Tolerate invalid property numbers. The bug should be fixed now in version 1.2. Configure your 1541U-II for a 16 MB REU. There is now an easy way to load gamefile images into REU on real hardware: REU Image Loader, http://csdb.dk/release/?id=122290 . It's relatively speedy if you have JiffyDOS, not sure if other turbos are supported/applicable. Just point it at the z4/z5/z8 file, wait for the image load, then load and run Zeugma. I get an [Illegal opcode] error. It's possible to run Zeugma using the Windows version of the VICE emulator; however, the VICE emulator will stomp on any REU save file that is not exactly the size that VICE expects it to be. Your story file will be full of zeros and Zeugma will report that it cannot run a story file of version 0. To work around this behavior, you will need to pad the z8 story file to exactly the size of the expected REU before loading it in VICE. Then you can load the padded file into the emulated REU and start zeugma. Such beautiful and outstanding work on getting this emulator operational. I confess however that for us emulator users, part of the attraction is the ability to have a "true" C64 experience... I would like to therefore politely request the ability to revert Zeugma back to classic C64 fonts and colors, perhaps via one of the function keys. I am most impressed with the speed and clear font of this interpreter. It's even faster than the official Infocom games on my Atari ST! I would like to change the default colors to green on black, as black on white is a little hard on my eyes. Unfortunately, I don't understand assembler at the best of times, and am getting a bit lost! I'd love to try this but am confused about how to load the z-file into the C64. I assume I just copy the file onto a floppy (or D64)? I know it is probably screamingly simple, but has anyone written a step-by-step guide on the whole process? Ideally I'd like to try this on a Win-based emulator like VICE or CCS64. Revisiting the BBC micro port idea. Adventures so far: the Beeb, which has an actual OS, uses the top of zero page for its own purposes, so the code residing there on the C64 needed splitting out into the self-modifying bit at the bottom, and the rest, which can usefully be stored at the bottom of page 1. Current zp usage is 153 bytes. Then there was figuring out why the VM was trying to access addresses starting at 5fff00 and working downwards, well beyond the extent of the story file. Hmm, "property cache", you say? Most recent facepalm was when I was single-stepping a crash and came across the instruction "jmp ($3dff)". This is a self-modifying jump table (jumptbl_oper) at $3d00 ($3300 on the C64 version) indexed by odd values. Early 6502s (including the 6510) perform the wraparound incorrectly, and indeed you have put the high byte at the beginning of the table as the buggy CPU in the C64 expects. But not the more recent, non-buggy 65SC12 in the BBC Master I was emulating! It does wraparound correctly, and thus loads the "wrong" value. Does this code really work on a SuperCPU? More to the point, an actual OS that can't be paged out, so any help it can provide is useful in alleviating the critical address space shortage. Also I can understand writing your own display routines, but your own *keyboard scanning code*? Is this what life is like on the C64? Hi! Great work on the BBC Micro, and sorry for the C64-isms. I haven't actually tested on a SuperCPU, and I agree in hindsight that it might fail for the reason you suggest. As for keyboard scanning, there's a routine in the OS, but mine supports 3-key rollover and flexible key-repeat functionality. Besides, to use the stock routine, some research would be necessary to figure out what memory areas to leave intact. With 64 kB of RAM at hand, it was easier to just implement it. Also, why have black on light grey in the first place, just hurts both eyes and screens? Do you know if they will work with z8 files?. It would be cool to play current IF games on the C64. Thanks. Varicella (shown in the screenshot at the top of the page) is a z8 game. That doesn't automatically mean that all z8 games work. Det är troligen betydligt mer än fonten som skapar problem. Inmatning och utmatning av svenska tecken, användandet av en alternativ alfabetstabell, och tidsstyrd inmatning är exempel på områden som måste funka för att köra Stugan, och som krånglar även i många ganska mogna speltolkar.